12:06 p.m.: Plows are out and about in Denver but they have a lot of roads to cover. If you want to see which areas the city is currently planning and see where they are headed throughout the day Monday, click here for the city's Plow Tracker. 11:34 a.m.: We're getting our first look at snow totals from across the metro area. The big winners so far are the Westminster and Superior areas, which have each seen upwards of 10 inches in some places. Click here for more. 11:16 a.m.: The crash at 29th and Welton has been cleared and the L Line is servicing all stations again. Expect delays to continue while things return to normal. 8:27 a.m. — Wheat Ridge Police PIO Sara Spaulding said the southbound lanes of Kipling Street are closed from 32nd Avenue to 38th Avenue. Cars were stuck on the hill and while police have cleared them, the road is still not safe for drivers. This is a major route to Wheat Ridge High School. 8:12 a.m. — Drivers are struggling to get their cars up the hill by Sheridan Boulevard and 52nd Avenue. 7:47 a.m. — A few cars are stick trying to go up the ramp from southbound I-25 to Speer Boulevard. 7:43 a.m. — Eastbound on I-70 is closed at the Eisenhower Tunnel due to a car fire inside the tunnel. CSP Eagle said I-70 is closed eastbound at mile marker 205 in Silverthorne due to the fire, in addition to multiple spin outs. It's unclear when the tunnel will reopen. 7:29 a.m. — According to the FAA, a traffic management program is now in effect for traffic arriving to DIA. This is causing flights to be delayed by about an hour and 4 minutes on average. FAA is holding some planes in other cities, sometimes up to an hour. 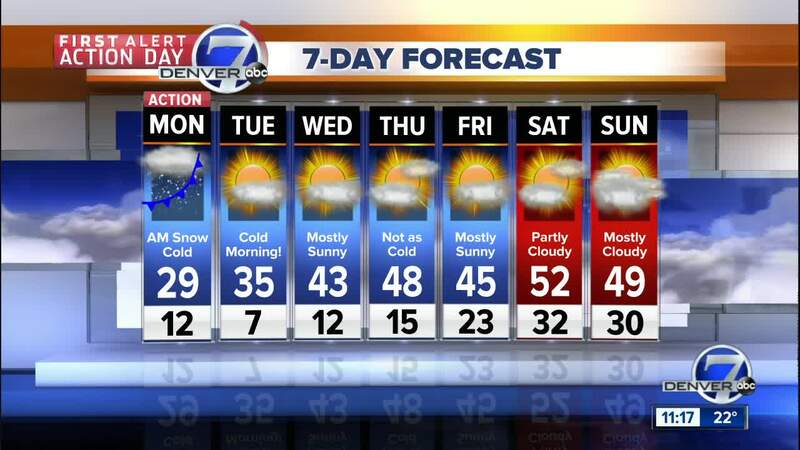 Flights departing from DIA may be delayed by a few extra minutes as planes are de-iced. 7:20 a.m. — Access from the westbound lanes of I-70 to Brighton Boulevard is closed due to a crash involving a semi. 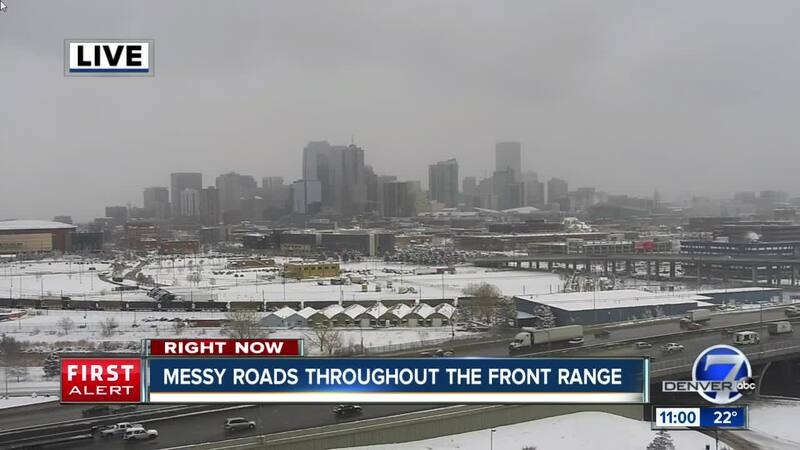 7:12 a.m. — Denver is now on Accident Alert, meaning authorities will only respond to crashes that involve personal injury, a street closure, impaired driving or damage to public property. Click here for more information on Denver's Accident Alert. 6:58 a.m. — A car has slid off Speer Boulevard near Champa Street and almost went completely over the edge into Cherry Creek. Police have arrived and are working in the left lane. 6:13 a.m. — If you're headed east to the airport today, get ready for some snow-covered roads. Denver7's Micah Smith reported that cars are traveling about 25 mph on I-70. But DIA told Denver7 that operations are normal at the airport. 5:12 a.m. — Several crashes have been reported on southbound I-25 near Happy Canyon. 4:53 a.m. — Clear Creek, Jefferson and Glipin Counties are on accident alert. 4 a.m. — U.S. Highway 6 Loveland Pass is closed due to adverse conditions.